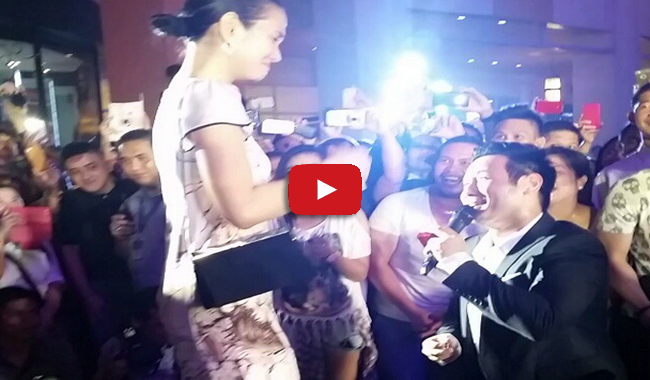 John Prats proposed to Isabel Oli Wednesday, September 24 at the Eastwood Citywalk in Quezon City. Oli was his long-time girlfriend and at last they were engaged. The proposal was confirmed in various social media posts of celebrities and friends including Camille Prats, Sherilyn Tan, Chynna Ortaleza, Sam Milby and Angelica Panganiban. John finally took their relationship to the next level by doing a dance mob and asked the actress to marry him in front of a huge crowd. John Prats ask the question, "Pwede ka bang maging Mrs. Prats ng buhay ko?" then Isabel immediately said yes! Congratulations to newest celebrity couple John Prats and Isabel Oli. Hope both of you will prosper in life being engaged.